Yeah, I know… That subject header is both corny and a bad joke. Sorry. Anyway, Sherlock. While I loved how the BBC series started its second season, I found the following episode – “The Hounds of Baskerville” – a bit of a disappointment. Entertaining, yes, but also not nearly as clever or charming as “A Scandal in Belgravia” had been. (Preferring naked yet tastefully presented Irene Adler over a hoary CGI hound? Perish the thought!) In that respect, season 2 shaped up to reflect the pattern set by the first three episodes: one good, one weak… one brilliant? 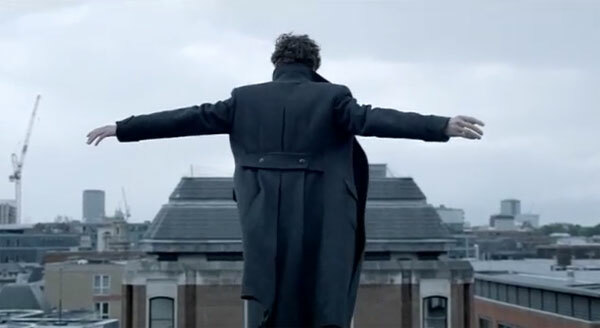 Thing is, there are so many scenes featuring Moriarty in “The Reichenbach Fall”, it frankly becomes a bit boring… and yes, his shtick does begin to grate. He still has many effective moments and a highly surprising exit from the episode, but there was a scene about halfway into the episode that I was hoping to end sooner rather than later. Having said all of that, the episode was entertaining and, at least to my mind, better than “Hounds” – and it did one thing exactly right: when the whole world turns against Holmes, they don’t go for the tired old “Even his best friend doesn’t trust him…” Watson, the sort of friend Holmes may not deserve and quite possibly isn’t smart enough to wish for, never gives up, never buys Moriarty’s fabrication. And that’s what I’ll be tuning in for when Sherlock returns: not the reveal, not the cases. Holmes and Watson. Damn… I’m turning into the modern-day equivalent of a Mulder/Scully ‘shipper, aren’t I?